A young woman who questions her sexuality after her first one night stand with another woman. Jenna Laurenzo is a graduate of Carnegie Mellon University. She created the web series Parker & Maggie and the pilot presentation Water with Lemon, before working as digital producer for Bravo’s Watch What Happens Live. She made her directorial debut with her ten-minute short film, Girl Night Stand, which screened at festivals around the world, and then was released online where it went viral having well over 2 million views. 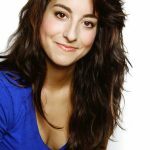 Most recently, Jenna wrote, directed, and starred in her first feature, Lez Bomb, which is currently in post-production. Lez Bomb was executive produced by Bobby Farrelly and Sprockefeller Pictures. Jenna’s upcoming projects include a feature in development with Depth of Field Productions. Jenna’s represented by Brillstein Management Partners. This entry was posted in 2017 International Short Film Programme, Short Films, The 2017 Film Festival Programme. Bookmark the permalink.